Holden Decor Richmond Highland Stag Wallpaper is designed to add a rustic touch to your home this season. First of all, this eye-catching wallpaper is part of the Imaginarium Wallpaper Collection by Holden Decor. So it is sure to make a welcome addition to any room. 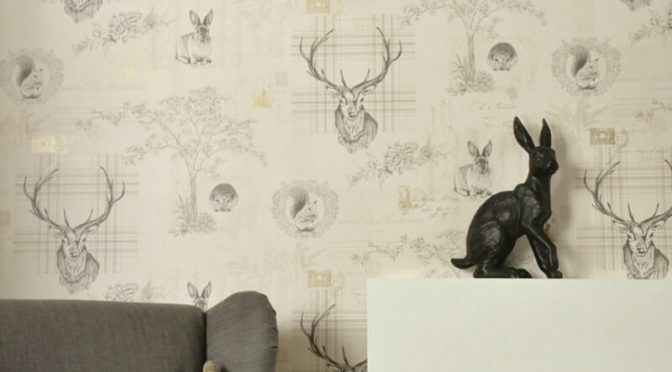 The wallpaper features a stag inspired design and comes in a shabby chic style. Furthermore, it is brought to life with a beige and charcoal colour scheme. So it will transcend the seasons. Finally, the Holden Décor Richmond Highland Stag Beige/Charcoal Wallpaper is perfect for updating a living room, hallway or bedroom. Add charcoal home furnishings to complete the look.